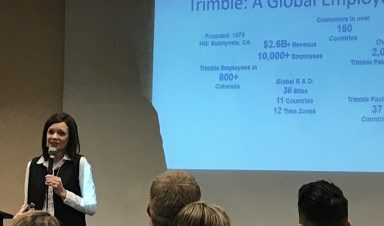 “If I learned anything in life, it’s that being intentional is important,” Kim Chaumillon, Director of Global Talent Management at Trimble Inc. shared in her seminar at the International Business & U student conference. Hosted by the World Trade Center Denver, the conference brought over 400 students together across the Rocky Mountain region to showcase different types of international careers. The conference had a variety of speakers and panelists, as well as an expo featuring universities, study abroad programs, and organizations with specific international opportunities. The Business School was proud to see the organizer of the event was one of our own MS International Business students, Karen Warsh. As a heavily involved student, she recently landed a job as their Director of Marketing and Engagement by networking at the World Trade Center. Chaumillon emphasized that a good GPA and good attendance doesn’t differentiate you enough. At her company Trimble Inc., they are more likely to hire someone with a lower GPA with strong interpersonal skills than someone with just a high GPA. Relevant and progressive jobs: It’s a big red flag when someone enters the workforce with zero work experience. It’s too risky for a company to know if your academic knowledge translates into the business world. Find an internship or job that’s relevant to your field. Progressive internships or jobs demonstrate that you are responsible, have growth potential, and have a good work performance. Extracurricular activities: Get involved in clubs, student conferences, or helping with a major class project. This shows ambition and that your curiosity goes beyond academics. International experience: A study abroad trip or internship overseas provides excellent experience. However, not everyone has that luxury. Show that you are internationally savvy by joining an international club or learning a foreign language. This shows that you are thinking about the world and your perspective is beyond local. “All of the experience in the world doesn’t count if you can’t look somebody in the eye, you can’t shake their hand, or you struggle to communicate your message,” Chaumillon explained. “You have to leverage your interpersonal skills and explain how your experience is relevant to the opportunity,” Chaumillon elaborated. In other words, think of how to translate your skills or experience into something that the company cares about. Another important skill is having a growth mindset rather than a fixed one. Having a growth mindset means that you believe everyone can continually grow and improve. On the other hand, people with a fixed mindset believe that at some point in life you are unable to improve your talent and intelligence. When we’re in that growth mindset, we view obstacles and challenges as opportunities to continue to make ourselves better versus threats to our identity. When we’re in that growth mindset, we view obstacles and challenges as opportunities to continue to make ourselves better versus threats to our identity. Interviewing is kind of like dating. As an employer, you want to know that somebody wants you. As an interviewer make the company feel good, that you researched them, that you understand what they’re all about, and tell them specifically why you want to work for them. “If you aren’t curious about us then maybe you aren’t curious about solving new innovative problems or expanding into new markets,” Chaumillon shared. This shows that you’ve really done your research. By asking the “small questions”, like vacation time, you aren’t thinking big picture. By thinking big, demonstrating a growth mindset, leveraging your interpersonal skills, and explaining how your experience is relevant to the company, you can differentiate yourself from the crowd. Business School professors and instructors have personal business experience abroad and bring that knowledge to the classroom. For example, Missy Kautt recently shared her decades-long experience in international corporate work. She highlighted her time doing strategic planning for ExxonMobil across the globe, most notably her work reducing Mobil Oil’s ownership share in ARAMCO. She teaches courses for BSBA International Business, MBA, and MS International Business. The Business School is also home to the Institute for International Business, which was awarded the prestigious Center for International Business Education and Research (CIBER) grant designation by the US Department of Education. Students can also gain firsthand experience through a number of study abroad programs from Dubai to China to Belize. Students can explore entrepreneurship, sports and entertainment, sustainability, finance, among other interests in a global context.